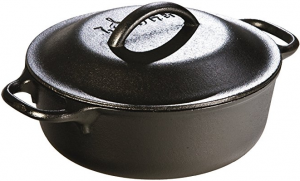 This is an awesome deal on this highly-rated Lodge Cast Iron Dutch OVen — 40% off the regualr price! Order it today for just $18.59. At home in the oven, on the stove, on the grill or over the campfire; Great for induction cooktops. Previous Post: « Hydro Seal Band-Aids FREE at Walmart!